There’s no doubt that music is a great healer. It lifts the spirit and transforms lives with its incredible harmonic energy. Today the power of music is transforming the lives of many people in New York who are in need of its uplifting energy, through the innovative volunteer programs created by www.SingforHope.org. This amazing program brings talented musicians to the places where their healing talents are needed most, in schools, nursing homes, shelters and more. At www.singforhope.org, we believe in the power of hope as communicated through music. Our Sing For Hope Pianos Project is a public arts project that has an impact on 1 million New Yorkers and visitors to New York each year. What is involved in this program? For two weeks each summer, we bring 50 utterly unique, artist-created, individually painted pianos to the parks and public spaces in New York, so that everyone can enjoy their music. These beautiful street pianos in NY are part of a wide-ranging public installation that brings music to people as they are walking and enjoying their everyday lives. Each of these pianos comes with an individual tarp to keep the piano safe from the elements. The public is encouraged to help protect each piano so it can be enjoyed by the public and by the students whose schools will own the pianos after the installation is completed. This year, there is an even greater aspect to the Sing for Hope pianos project. In 2016, this public works project will go beyond being a public installation, and will become a permanent part of the life of our New York Public Schools. This year, after the two week music installation of these pianos, they will be donated to New York public schools, to become part of those school’s curriculum, benefitting an estimated 15,000 New York City School children. The idea behind this project is to bring music to the public and to public schoolchildren. With the help of the public and the volunteers who help keep this program alive, we can make a difference in the lives of students and people everywhere. Do you know the after effect of dirty toilets to our family specially to our children? Please watch the video below and share it so we can save lives and work together towards the #1MCleanToilets movement. There are plenty of diseases that we can pick up from our very own toilets. This is the very reason why I make sure to clean ours with only the best, Domex Ultra Thick Bleach. And mind you, I do the cleaning personally. I have this OC-ness when in comes to our toilets. 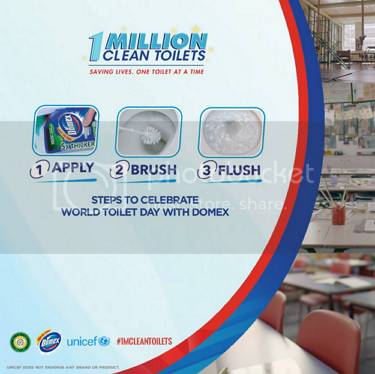 Domex leads the fight against diseases caused by unsanitary toilets through the 1M Clean Toilets Movement. In celebration of World Toilet Day, Domex leads a toilet clean-up in East Avenue Medical Center, symbolizing their commitment in helping people, especially those who have been afflicted, to fight diseases through clean toilets. In support to the 1 Million Clean Toilets Movement and World Toilet Day, I pledge to properly clean my toilet, to protect my family from disease caused by unsanitary toilets. Simply answer the question above with a photo of or with your love ones doing a check mark hand gesture using your left hand and post it over at Facebook or Twitter for a chance to win Domex gift packs. Tag Nicquee’s Nook or @NanayNicquee and use #WorldToiletDay2015 #1MCleanToilets. Make sure that your post is Public.